have been reports of a pair doing a bit of remodeling at the nest and a pair (presumably the same one) has been seen interacting at the nest and in flight – both good signs of pair bonding. Because of the nest’s proximity to humans, the pair piqued lots of curiosity and garnered quite a number of eagle watchers last year. Their human neighbors have been keeping a watchful eye on the nest all winter and have seen a number of interesting things. The ones that have intrigued me the most are ones at the nest. There was one report of three adults at the nest and reports of juvenile(s) and/or juvenile – adult at nest. I witness an interaction between an adult and a juvenile at the nest about a month ago. I have dug around a little, researching aspects of eagle behavior but have found nothing that specifically addresses these encounters. All of these interactions occurred during the time of year when eagles are actively on the move. Eagles are facultative migrants – meaning northern nesters will move southward in the winter to find better foraging conditions. Eagles are, also, simply wanderers – especially juveniles and young adults. The basic thought is they are looking for prime real estate; they will soon be setting up their own territories. So my 1+1=3 theory is, with the eagle population booming across the Southeast there are likely hundreds of bald eagles in the skies across the region on any given day during this seasonal wanderlust. Think about all the great eagle habitat around – Fontana, Douglass Lake, Lake Norman, the Little Tennessee, French Broad and Pigeon rivers, etc. Plus eagles have great eyesight, researchers believe a bald eagle can spot another eagle soaring from as far as 50 miles away. And eagle nests are large – can be 6 to 10 or more feet across and 6 to 10 or more feet deep – probably easily spotted by a soaring eagle. Add to that eagles are apparently curious creatures so it’s easy to come up with a myriad of hypotheses – say, curious eagle sees nest and decides to get a closer look; one of the nesting pair sees curious onlooker and decides to drop by and let said onlooker know, uh, this nest is taken, etc. ect. ect. But the fact two eagles were seen housecleaning and two have been heard and seen displaying courtship behavior bodes well for another nesting attempt this year. While North Carolina is a Southeastern state, bald eagle nesting times in the mountains coincide more with the Northern U.S. nest building, refurbishing in mid to late January fits well; egg laying and incubation most likely from February to March – 35 days of incubation – hatching, late March to early April and fledging in May. 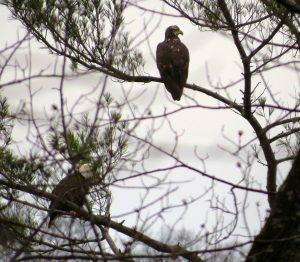 The Lake J eagles definitely have a devoted (and hopefully watchful) core of human neighbors and if fledging is successful this year the core will grow. I have my talons crossed once again!